These cupolas for houses and garages are designed for mounting weathervanes. 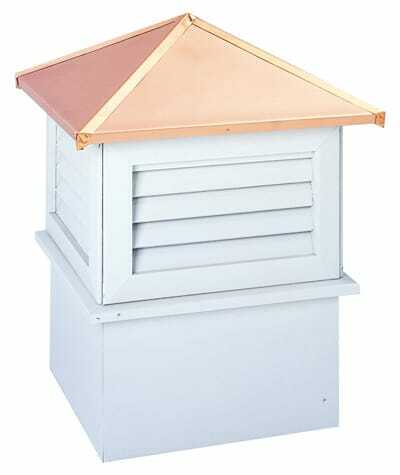 Each Whitehall wood cupola is sealed with primer and features a copper roof. Good Directions cupolas are made of vinyl or wood and have copper or wood roofs. 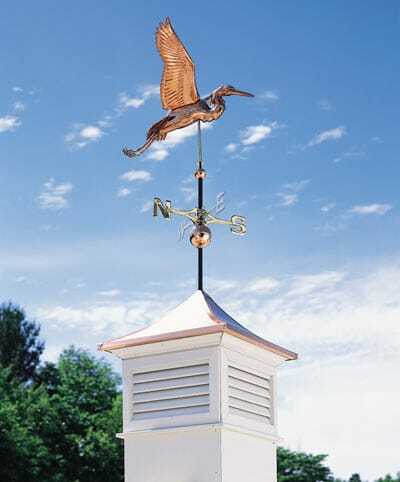 Timeless and classic, weathervanes and cupolas are a wonderful way to enhance the beauty of any home. The MailboxWorks is proud to feature Whitehall and Good Directions cupolas including barn cupolas, shed cupolas and gazebo cupolas made with the utmost quality and design. Roof vent cupolas were originally designed to let in light and fresh air, while providing a lookout. Today cupolas are used as architectural features on houses and garage rooftops. Whitehall cupolas feature wood construction and solid copper roofs. Good Directions white vinyl cupolas are weather resistant and require little to no maintenance! Sealed with white primer for maximum durability, Whitehall and Good Directions cupolas are ready to be painted and installed, creating a unique, custom addition to your home or other building. Available in all sizes, we have large cupolas to sit atop your house roof or smaller cupolas for gazebos, garden sheds, barns and more. Don’t forget about Whitehall or Good Directions weathervanes that can be added to copper cupolas for the perfect finishing touch! Browse all of our home and garden accessories!